GM's strange Chevy Volt superbowl ad caused a couple Fox News commentators to launch into a flimsy and leaky hit job on the Chevy Volt. It's superbowl season and one of the now-traditional side-shows to that football game is the advertising run during the show. Because of the large audience there's huge competition and high prices for superbowl advertising spots. Reportedly GM spent $3.5 million for a spot to advertise the Chevy Volt, which led to a piece on Fox News yesterday in which Mark Morano slammed the ad and the Volt with a string of borderline or false accusations. In the piece Morano talked to the right-winger story-line that every expense GM makes spends taxpayer money (because the government still owns a chunk of the company), making the Volt a waste of taxpayer money, because another right-wing oriented publication decided to call it a flop. Because they do such a good job spinning this line of reasoning, its worth teasing apart what they say. While most of it is false, they sound so convincing that the casual listener who doesn't know better will come away with a falsified impression of the truth. The advertisement in question is a little strange, showing a Chevy Volt owner discovering a group of aliens from the UFO flying overhead excitedly scrutinizing his Volt, because of the advanced technology. It's the kind of advertisement that makes one scratch their head and wonder what the marketing department was smoking. Which, in turn, is fitting with GM's history of advertising for electric vehicles, because the EV1 commercials were also strange and widely reviled. But is a strange TV ad any reason for flinging a string of inaccurate accusations around? The piece starts with "GM spent $3.5 million on that ad, or the equivalent of 89 Chevy Volt's," to which Mark Morano explained that the Government bought that ad with "our money". Why the Government? Because the Government still owns 26% of GM. Really? This is clearly false because GM's advertising, like in any company, is controlled by GM's Marketing Department. Marketing Department expenses show up in the corporate financial results as a Marketing expense. Meaning the $3.5 million for that ad will appear in GM's next 10-Q filed with the SEC in March or April. How is that a Government expense? Next Morano claimed the advertisement was an insult to space aliens. He said "because the 1896 Roberts Electric Car got the exact same range as the Chevy Volt, 40 miles," the space aliens wouldn't be interested in the Volt because it's technology is the same as was used 116 years ago. Unfortunately this meme of the 1896 Roberts Car and the Volt has filled up the search engines making it hard to find accurate information. As a general rule the early electric cars had maximum speeds around 20 miles/hr, and had extremely different technology than modern cars. Instead of a light weight lithium-ion battery pack, it would have been a heavy lead-acid pack. The Roberts Electric Car would not have had a gasoline generator for extending the range, nor air bags, nor OnStar, nor power steering, nor about a zillion other technological advances made in the last 116 years. How could any rational person get this confused? Where next did Morano turn? Sales figures. He described January's Volt sales as another bad month, and indeed there was a significant drop in Volt sales last month over December's sales. The whole picture makes Obama's stated goal of 1 million electric cars by 2015, as Morano points out, look like an impossible dream. And, of course, their hidden message is that because Obama's dream here seems impossible, it makes him a failure. Still, their point about Obama's 1 million electric cars goal is a valid concern. So, Morano asks, what is GM's response to having dismal sales of a car that's no better than the 1896 Roberts Electric Car? To spend $3.5M of our money on a superbowl ad. As we've already seen, the money to pay for that ad wasn't government money, it was GM's money. Whether the Chevy Volt sales figures are dismal and worthy of being called a "flop" depends on your point of view. The Volt is a new technology car, and its sales shouldn't be judged against regular gasoline cars. Instead the proper benchmark are other new technology cars like the Toyota Prius. The Prius was not a hit right off the bat, it took four years of "dismal" sales before Prius sales took off. It's not unreasonable that the same could happen for the Volt. Morano, having constructed the argument that the Chevy Volt is a complete and utter dismal flop of a failure of a car, is asked what should GM do. Should GM just bury the Volt, or should GM treat it as a boutique car that nobody buys but brings them into the show-room so they'll buy an SUV? GM is partly to blame for this line of reasoning because they call the Volt a "halo car" that gives GM a good image, and their marketing department has determined they've had many new buyers come into GM show-rooms because of the Volt. Sometimes buying cars other than the Volt. GM's claim is this one aspect to what makes the Volt worthwhile. As we argued earlier, because the Volt is selling better than the Prius did in its first years, the Volt could be seen as being in a stronger initial position than the Prius which could mean great things for its future. If, that is, GM has enough stick-to-it ability to see themselves through to developing a "Gen 2 Volt" that then becomes the hot car everyone wants. Morano's tour de farce ends with repeating the bogus $250,000/car subsidy claim. As we discussed a month ago, that $250k subsidy figure is from a badly reasoned "study" by the Mackinac Center for Public Policy that gives an absurdly inflated picture of the government support for the Volt. Every year our eyes collectively pop out as we learn the amount of money being spent on superbowl advertising, and this year is no different. What we see with Morano's analysis of the Volt superbowl ad is a flimsy argument, that doesn't hold water, claiming the Volt is a dismal flop. Those who don't know just how flimsy an argument it is, would conclude the Volt superbowl ad is a waste of government money, because the car has dismal sales, and is no better than a 116 year old electric car. Instead we know the superbowl ad was bought with GM's money (whether it was wasted is a matter of opinion), the sales are better than the first year of other new technology cars, and the technology in the Volt is vastly superior to the 1896 Roberts Electric Car. Seems that Morano's accuracy is around 10% because we're giving him a bit of credit for Obama's stretch goal of 1 million electric cars by 2015. Thank you for this post. As far as sales figures are concerned, I guess that part of the reason Volt sales dropped in January was because of the battery scare. However, I suspect many (most?) California buyers are waiting for Volt models specifically modified to qualify for the HOV sticker (and an additional California rebate). They're not building these until Feb 6, 2012. Morano's ClimateDepot.com is a project for "The Committee for a Constructive Tomorrow", which has gotten plenty of Richard Mellon Scaife money. First off the Mr. Morano is not a member of Fox news. Second, our government IS paying 26% of the ad as we own 26% of GM. Third, the Volt is nothing but a gas powered locomotive that run on streets instead of tracks. Fourth, the reality is under actual use the only way you can get 40 miles per charge is no headlights, no heat or AC, no head wind or hills, no breaking or turns, limited radio. In other words on a prayer. Fifth, the sales figures speak for themselves. there basically are none. Many, to include some 500+ in December, were leased by the government or by companies with special interest to the government. Articles have been written stating there is some $250,000.00 subsidy per car. That statement has had little if no challenge other then by yourself. Even GM was pretty mum on this one. Sixth, you can't compare the early sale of the Prius to that of the Volt. The Prius broke the ice on electric/hybrid cars paving the way for all others to follow. Final words are the Volt is too expensive (average buyer family income 0f $175,000.00), impossible to justify in fuel savings, too small, cannot be purchased by over 1/2 of the market (live in apartments/condos with no where to charge), have too short a range on electric and the list goes on. It's a shame the marketing people at GM really blew this one but they still have David Herron to cover for them. In 4700 miles, my average is 38.9 miles with a high of 43.1 miles per charge. I have a rather long commute (on 70mph highway, where I do use both lights and heat) so at the moment my gas usage only works out to 166mpg. However, now that there's a charging station by my office, I haven't used a drop in weeks. As a new 2012 Volt Owner, I disagree with limp. I live in Florida (granted its flat) leave for work and return most days in the dark commuting 16-22 miles one way in heavy stop and go traffic....running A/C/lights/Bose stereo/and occasionally windshield wipers and rear defrost. My battery range has been 44-46 miles under these conditions. I am amazed at the ignorance of some people as they easily forget the "costs" of new technologies when introduced to the public. Think about what a microwave oven, 21" color TV, CD player, cell phones all cost when they became available and entered the market place in their earliest days. I traded a 2011 Lexus on the Volt and couldn't be happier with my new car. I don't agree with a lot that the President has done since taking office, but the GM bailout was not to save and Volt and bring it to the market. There were tens of thousands of jobs at stake, and if GM's increased market share isn't enough to convince you that the bailout was a good thing, then nothing will convince you otherwise. Hi New Volt owner. Congratualations on your excellent mileage. Be sure to advise GM as they will be glad to hear it as none of the magazines that test drove the car could equal your results. I am amazed at my ignorance in forgetting the cost of new technology ie. microwaves, color tv's CD playersand cell phones. The difference with the Volt is the Volt has nothing to offer but additional work and costs. There are literally hundereds of cars to choose from that you don't have to mess around with every time you want to use it. People were willing to pay for all the items noted above because they offered something people wanted like convenience, made their life easier, enhanced their entertainment or changed their life like the cell phone. Trading a new Lexus for a Volt is obviously nothing but an ego trip and something an ignorant person like myself and 99.9% of America wouldn't do. I don't know how you wound up on the bad policies of Obama but please take note that the bailout bailed out the unions. There are bankruptcy laws that work just fine for corporations. There are literally thousands of companies to include basically all the U.S. airlines that have gone bankrupt. American airlines just did so and never missed a flight! Well, limp, you're going to have to deal with it. GM got a bailout and is making money again. That's irritating to the right-wing, but better that than the Pension Benefit Guarantee Corporation on the hook for any shortfalls in the pension plan (to which AA is trying to slough their obligations by going Chapter 11). The post is about Fox News (and their guests) spouting out-and-out FUD about the Volt. Critique the Volt if you like, but at least be honest. You're not ignorant, and you're not stupid, but like Fox, you're disingenuous. Many of your criticisms could have also been leveled at the original Prius -- significantly more expensive and complicated than a Corolla -- but, in time, the hybrid it introduced has been an unqualified success. So I'll repeat a question I made elsewhere. If a plug-in hybrid like the Volt is such a bad idea, why is clever Toyota doing it too? Also, if you think catching a flight on an airline in Chapter 11 is like buying a car from a bankrupt auto maker, why don't you go buy a Saab? Hey limp, I'm not sure why you think trading in a Lexus for a Volt is an ego trip. I'm not sure what Lexus you have in mind but the base model of the ES350 is several thousand dollars over what you would pay for a base model of the Volt. So let's go with that for comparison's sake. Now I own the Volt and can tell you quite a bit about it and I know I've never been in the ES350. So it's incredibly hard for me to say which is better. But, and correct me if I'm wrong, but you haven't been in a Volt have you? And have you been in a ES350? I will not argue on the merits of the ES350 vs the Volt as I don't have practical experience with the ES350 but humor me a little bit for a personal evaluation of the two cars from their specs. The ES350 has 5 seats which, for most people, is better than 4 seats. But for me personally, I don't care about the extra seat. I have a wife, a 4 year old and a 6 month old. I don't need or care about a 5th seat as it may impact me on 1 or 2 days a year and for that I can use my CRV. The Volt is currently getting me over 300 MPG. The EPA rating for the ES350 is 19 and 27 (city and highway). I've run the number at about $3.50 per gallon vs my last car that got a combined 30 MPG and the Volt saved me about $2,000 per year. If I'm saving about $2,000 per year in a car that gets about 30 MPG how much will I save compared to a car that will get roughly 24 MPG combined? Maybe $2,400? Does that sound fair? I personally plan to have the Volt for several hundred thousand miles but let's just say I go for 8 years in the Volt. The total cost of ownership for the Volt will be about $20,000 less ($2,400 times 8 plus the price differential between the two). Now, as I said, the ES350 may be an awesome car but is it worth $20,000 more over the Volt for a lifespan of 8 years? It's an open question but I'm guessing that I would rather have the Volt plus $20k in my pocket than the ES350. I'll add one little thing on to this analysis. 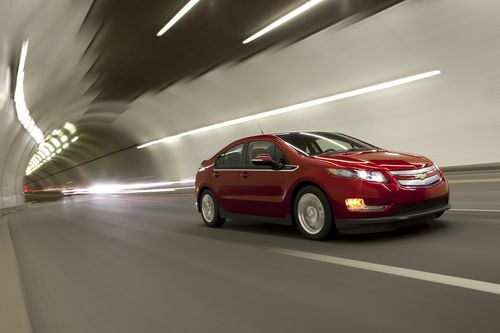 The Volt's 0 to 30 MPH time is about 3.2 seconds. It won't be confused with a high end sports car but, believe me, it is quite fun to drive. Electric motors, while they don't have a lot of horsepower, have a lot of torque and it means that they are very quick off the line. So what I would suggest to you is that the Volt is probably in your neck of the woods now. Go test drive one (put it in SPORT mode to experience the fun of the Volt), go to voltstats.net to see what real world performance people are getting from it and then read gm-volt.com to get the viewpoint of hundreds and thousands of Volt owners (a lot of them are Republicans BTW) and I guarantee you that you will have your eyes opened. You will then, likely, understand why people who have traded in BMWs, Audi's, Lexus, etc. are VERY happy with their Volt purchase. You can still be against the bailout or the tax credits but when you look at the reality of the value proposition of the Volt you start to realize that this car is pretty damn awesome and can work out great for many people. Be well. Additional work? Limp, obviously you have never owned an EV. As an EV owner I never go to the shop for oil changes. I never stop at the gas station.. It takes 10 seconds to plug in an EV each night and 5 to unplug it. That's 1.5 hors per year. if you fill up your car once a week at 5 minutes a stop.. that's 4.3 hours.. You get an oil change at least twice a year. Add another hour. So me, the EV owner spends 1.5 hours a year, in his comfortable garage doing all that "additional work" plugging and unplugging.. the normal gas car owner has to be outside, maybe it's raining, maybe snowing, maybe cold, filling up his car and waiting in line at the oil change station. My 60 communte cost me $1.80 in electricity. The gas cost for the same communte. $9.50 (@24 mpg).. The Volt is not a pure EV (unless you drive less than 40 miles a day).. but it is close for many drivers. "Mr. Morano is not a member of Fox news." So what? It's not as though Cavuto is inviting people with contrary opinions. "Second, our government IS paying 26% of the ad as we own 26% of GM." Advertising is a normal part of doing business. They already have caps on executive pay. So wouldn't advertising help sales, pushing the stock up? Would you have it that GM stop _all_ advertising? Don't you think that would be silly? "Articles have been written stating there is some $250,000.00 subsidy per car." No, limp, articles have been _repeating_ that there is some $250K subsidy per car. It was immediately obvious that that figure came from amortizing R&D costs and grants over only one year. "That statement has had little if no challenge other then by yourself. " Baloney. David referenced an analysis on thestreet.com Google on setting-it-straight-chevy-volt-vs-the-government "Sixth, you can't compare the early sale of the Prius to that of the Volt." Of course you can! The Prius was expensive compared to similar cars, and had a slow start. "The Prius broke the ice on electric/hybrid cars paving the way for all others to follow." Wrong. The GM EV-1 was introduced in 1996. The Prius was introduced in Japan in 1997, and came to America in 2000. "Final words are the Volt is too expensive (average buyer family income 0f $175,000.00) […]" So what's the _median_ income? It doesn't take many millionaires to skew the average. "[…] impossible to justify in fuel savings, too small, cannot be purchased by over 1/2 of the market (live in apartments/condos with no where to charge), have too short a range on electric and the list goes on. " You could say the exact same things about the plug-in Prius, yet Toyota thinks there's a market for it. If you're right, then GM _and_ Toyota have to both be wrong. Actually, the Prius was originally sold at a loss with Toyota banking on long-term sales figures to make up the difference over time. It's original price point was about $19,000, on par with other cars of similar size in the c and s segments at the time (1999+). When the Prius debuted in North America, it was at about $21,000, again on par with other cars in the Toyota line that weren't hybrids but were of similar size, such as the Corolla and Camry. Toyota says they were breaking even at that price point. Finally, the Prius didn't receive any government money during its development or sales. I wrote an article about this here on TorqueNews that showed that comparing the early Prius to the Volt is not apples-to-apples. Limp I hear your passion but as a conservative Republican and a Volt owner your "facts" are just off. I have a 51 mile round trip commute and I'm entirely off of gas during the week since I get to plug in at work. So it is obviously not a "gas powered locomotive" as you indicate. If you go to voltstats.net you will see that a lot of people are driving the Volt 70 percent, 80 percent, even 90 percent plus in EV mode. As far as range goes you should check out what real owners are saying instead of people that had the car for a day or two and drive it in such a manner to really shake it out. During the spring, summer and fall months I was averaging in the mid to high 40 miles of EV range. Several times I actually got over 50 miles of pure EV range. Now that it is cold (albeit a mild winter here in Virginia) I'm in the low to mid 30's range. Follow other real owners out there at gm-volt.com (not GM affiliated) and you can read the pro's and actual cons of the Volt (as opposed to the made up stuff that is prominent among fellow conservatives). As far as the $250,000 subsidy goes.... think about it this way. The new Dallas Cowboy stadium was approximately $1.2 billion. If somebody made an argument that said it was an utter flop and was a poor financial decision because that equates to $150 million for each Cowboy home game in the first season and there is no way that the Cowboys can expect the 100,000 paying customers to pay $150 million collectively for each game, you would laugh at somebody for making such a poorly reasoned argument. Among some of the reasons why it is so wrong is that a) you don't need to recoup all the money in the first year and b) there are other revenue streams (concerts, college games, motorcycle races, monster truck rallies, etc.) that all rent out the location and generate revenue. Same thing goes for the Volt. The $3 billion "subsidy" that GM got from the feds covered many things among them money to help with the plant that builds the Volt. Other cars are also built at this same Hamtramck plant and yet that "think tank" conveniently assigned all the "subsidy" to the Volt. And then they only assigned it to the first several months of production of the Volt when the plant will function for decades to come. It's easy to see why the hypothetical Cowboy argument is a joke and once you understand some basic facts about how that one group come up with the $250k per Volt subsidy number you begin to realize how completely dishonest and yes, moronic, the argument was. As a conservative I'm ashamed to be associated with groups like that. And I would add that Morano has no ethical problems with repeating something he knows to be false. What does that say about him and Fox for continuing to say the same lie? Finally, the Volt is pretty expensive. It will not gain wide acceptance at the current price but neither will comparably priced Audi's, Lexus or BMWs. That is the main competition for the Volt and there is little doubt in my mind that for $35k (my net price) I would much rather have the Volt than one of those cars. There is a reason it won so many awards. I just wish more conservatives would test drive one and make up there own minds instead of listening to the propaganda about this car. Why do anti-American idiots like Cavuto & Morano think the Volt has anything to do with politics? I am more conservative than Cavuto ever dreamed of being, but I have a brain and can think, and I am a proud American and would not even think of putting down an American car brand, or any other American brand. If I was as dumb as Cavuto and felt compelled to put a Volt into any political party, it would be a rebublican car. Bush created the tax incentive. So it would be a Bushmobile. Seriously, with the economy so bad, and idiots like Cavuto putting down a car built in USA by an American auto brand, should be viewed as treason. At the very least, I would hope GM would give Cavuto a lawsuit that makes Cavuto lose his job. I mean calling an owner of a Volt stupid? That is going too far. With Cavuto's dumb logic, any company that is not 100% privately owned should not advertise. What stupid piece of garbage Cavuto is. So what, the gov owns 26% of stocks. It does not matter who owns the stock, people can buy and sell stock whenever they like. The company decides whether to run advertising or not, idiot Cavuto does not decide. Cavuto I hope you burn in hell for what you are doing. We really need to stop mistaking "entertainers" like cavuto and morano for legitimate journalists. Like a stand-up comic their script will not provide accurate reporting but only lines to get a reaction from the audience. Their success is only measured by ad revenue. Hey Steve, You are quite correct. As a "conservative" and as somebody who is a lifelong Republican I'm personally getting to the point where I'm quite mad at Fox and other conservative media. I entirely understand that no media is free of bias but the treatment of the Volt on Fox and Drudge is really eye opening for me. If you know anything about the Volt you understand that Obama deserves no credit for the Volt whatsoever. It's a product of a lot of hard work by people such as Lutz, Lauckner, Posawatz, Farah, et al. prior to the bailout and prior to Obama. In addition, as a conservative I can understand the angst about the bailout and the tax credit, however, to go to the point that Fox will out and out lie to their viewers... well, it kinda shocks the system. When a news organization intentionally misleads their viewers there would likely be two reasons for that course of action. One is that people are paying you to lie. The other is that they view it as a business opportunity to lie. In other words, some people will actually tune in to be lied to which leads to increased viewership which leads to increased advertisement revenue. I personally don't know if people are paying Fox to lie about the Volt or whether they are pandering to get ratings but I follow the Volt on a daily basis and, as a conservative there is little doubt that Fox is out and out lying about the Volt. To what end, I do not know but it disturbs me. "In the piece Morano talked to the right-winger story-line that every expense GM makes spends taxpayer money (because the government still owns a chunk of the company), making the Volt a waste of taxpayer money,..." Supposing this lie were indeed the truth, why do the talking heads on Fox News gloatingly report the idea of something that Americans produce as being a failure? Being Americans and , therefore, part-owners of GM, shouldn't they at least try to present products in a positive light or hope for its success? For the record, I'd proudly own a Chevrolet Volt if I could afford the price of admission. Note the irony of Mr Morano not criticizing the money GM spends at Fox advertising the Volt. If we applied the same "$250K subsidy" calculation method Murano uses for, say, cost per mile, a new $30k car would cost $30,000 per mile to operate. ($30k purchase price divided by 1 mile). This is equally as ridiculous and misleading as his "$250K subsidy" per Volt figure. With over 12k miles, I am getting 120 MPG with my fabulous Volt. Ignoring the terrific mileage, the Volt is the best new car I have owned in 30 years, foreign or domestic. My commute is much different than yours, I have not had to buy gas since I bought the car. In June. Of last year. Seriously, I have put 5000 miles on my Volt, and have used less than 2 gallons of the gas that was in it when I bought it. I expect that in June of this year I will have to put some gas in it since the car is programmed to use up gas that is a year old to keep it from going stale. I will follow the owner's manual and only put a few gallons in it at that time. That should be enough for the next year... Check Voltstat.net for some real world mileage numbers. 4000 miles. 452 mpg. Haven't bought gas yet after 3 months. I use solar pv to charge. Fuel savings are covering a third of the car cost ($33000) after state rebate and fed tax credit, leaving me with payments comparable to buying a $22000 car. I'm a amazed by the willingness of people to speak out when they are ignorant. Readers should take stock in the experience of real world owners like us. The Volt is a fantastic driving experience, far from the feel of a Prius. The Volt is a great value to some and not so great to others. Even though I'm getting over 300 MPG you are putting my numbers to shame. And yes, absolutely, the Volt is a great driving experience. For those who haven't driven an electric car it is difficult to describe. A lot of people think of "golf cart" when it comes to electric cars but that is so far from the truth. Go to Youtube and search on electric drag racing. When you look at some of the videos you kinda get a feeling for what it is to drive an electric car. Better yet, go to your local Chevy dealer and test drive an actual Volt. Put it in SPORT mode and you will understand what us owners say about the Volt. And yes, it is very far from the feel of the Prius. First off, I'm no fan of the Volt, GM, or any of the other bailout queens on Wall Street or in Detroit. The Volt, as far as I'm concerned, is about as useful as the Tesla Roadster was: it ain't. Maybe some people can afford one and enjoy driving theirs. Good for them. You're welcome for the tax dollars spent to subsidize the car, save the company that made it, and give you the write off you'll get for buying it. Still, my beefs aren't with the Volt in particular - it's just a convenient target. My beef is with the way government gets involved in these things when it should be leaving well enough alone. Morano might know a few things about climate science and skepticism, but in the end, he's no better than any of the other entertainers (as someone rightly put it) who deliver the news. I don't care what station you listen to. I've been on NPR and can tell you that the person delivering the news there doesn't know any more about it than any of the other talking heads do. News anchors (be it radio or TV) are not reporters, they are actors paid to regurgitate news given to them by others - some of whom may have been reporters, but many of which are nothing more than PR agents. Whatever the station, they all have a spin, an angle, an intended audience.. so what you're getting is never "just the facts, ma'am," it's always spun. Taht's true for MSNBC, Fox, or any other station you care to name on TV, radio, print, or Web. "You're welcome for the tax dollars spent to subsidize the car, save the company that made it, and give you the write off you'll get for buying it." I have a Volt. Thanks for the write off. You have kids? A mortgage? You're welcome for the write off. (Such an ignorant way to bash the Volt) All TV talking heads are meat puppets reading a teleprompter, but Faux News has a clear agenda. If they left it at voicing an opinion it would be fine, but they've gone beyond that into the realm of falsifications and distortions to push a narrative. I'm getting more than 250 MPG in my Volt. I've been to a gas station twice since August 2011, and I bought around 6 gallons each time. Yes, I have kids, yes I have a mortgage. But I also have two vehicles that didn't receive subsidies thanks to my taxes. Also, unlike my kids or mortgage, nobody is FORCING anyone else to pay for those things or the writeoffs available for having them. I had no choice in the bailouts and was FORCED (via taxation) to pay for them. Huge difference. Strange how people forget that the Ford CEO was in congress begging for money with the other 2 CEO's. Ford ended up not needing it, so why pay the gov interest on a loan that is not needed. But to say that Ford is somehow better because they were not bailed out, is a stretch. Even foreign brands like Honda and Toyota wanted money from the US gov. Good thing they didn't get it. Foreign brands get subsidized enough by their own country. To people like you, I say go buy a horse and buggy.